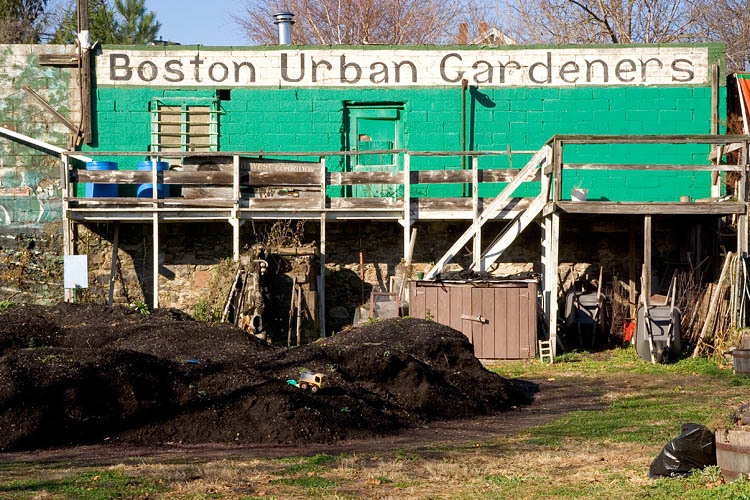 "When we first started urban gardening, I thought it would be pretty easy. Boy did I have a rude awakening." 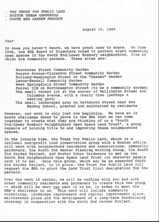 introduction to community organizing. 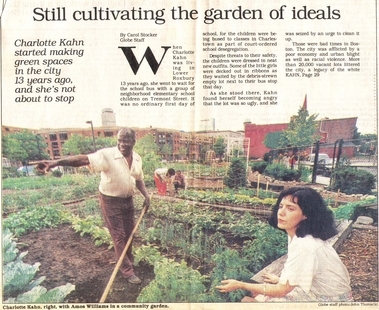 Volunteering there made me aware of the power of food/gardening as a means of organizing people across a broad range of ages, races and ethnicity. 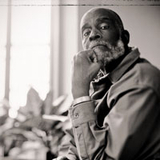 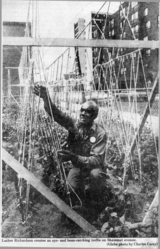 State Representative and visionary Mel King was able to convince his colleagues in the Massachusetts Legislature to provide funds for an urban fruit tree planting project. 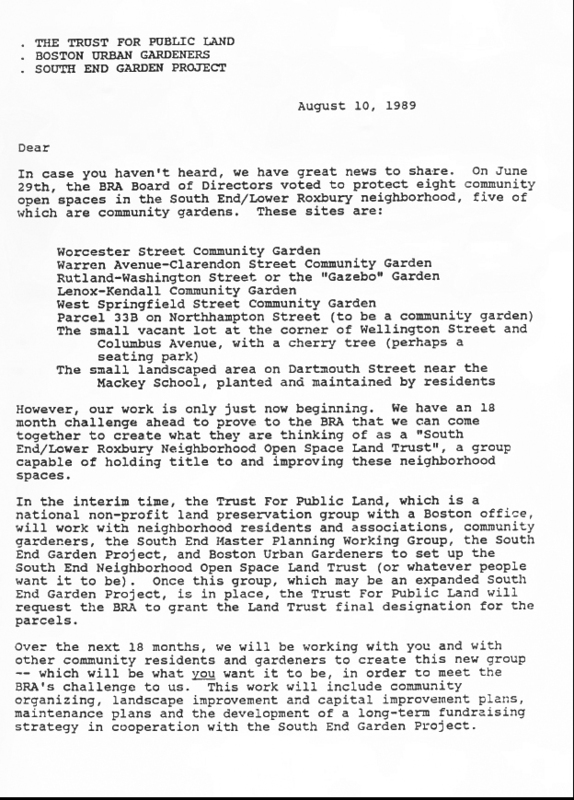 association of community leaders and garden organizers from the South End, Roxbury and Jamaica Plain, and quickly grew into a staffed organization with a number of funding sources. The belief that "...urban gardening contributes significantly to good mental health and nutrition, urban neighborhood vitality, aesthetics, and environmental enhancement..." led BUG to serve as a resource for and to work on a variety of projects with people in low income communities throughout the Boston area. 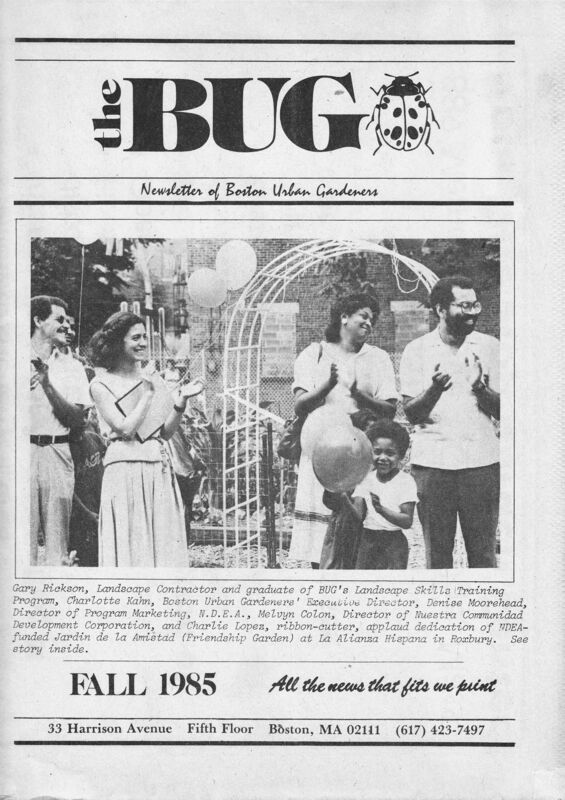 BUG also worked with the Boston Housing Authority, Massachusetts Department of Food and Agriculture, and other government and community organizations. 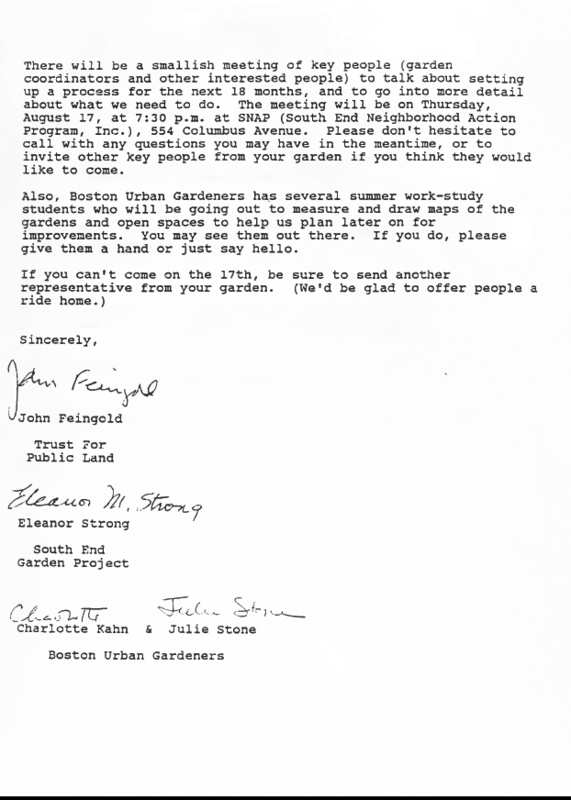 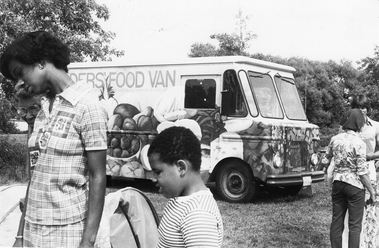 In 1990, BUG merged with the Southwest Corridor Community Farm, an organization with similar goals and complementary strengths, and became Boston Urban Gardeners at the Community Farm. Charlotte Kahn, Judy Wagner and Ed Cooper: The heart and soul of BUG. 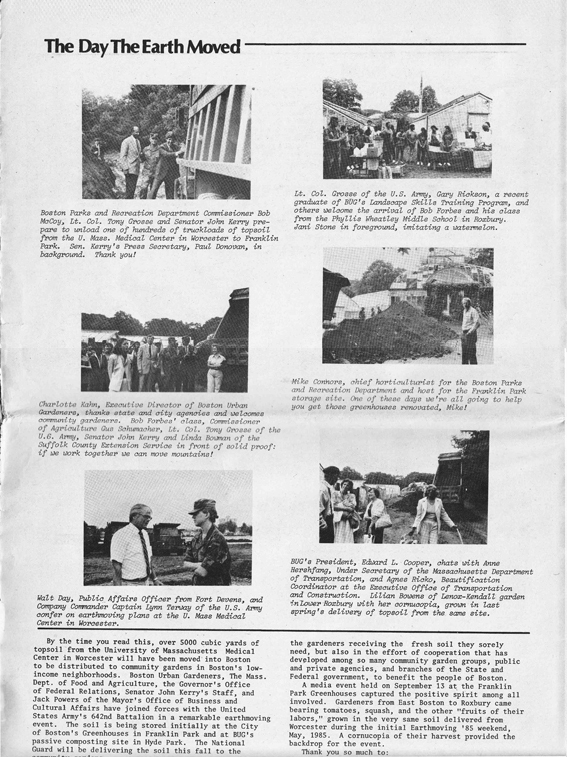 They also contributed a great deal of blood sweat and tears. 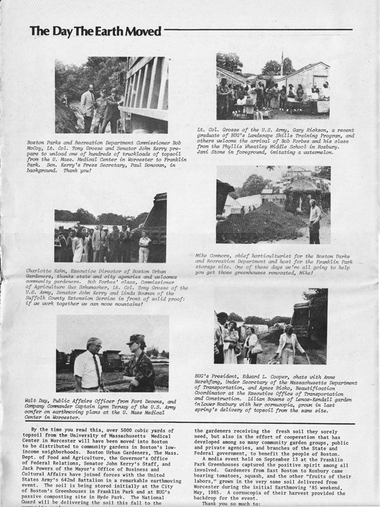 Charlotte and Judy were co-founders/co-directors. 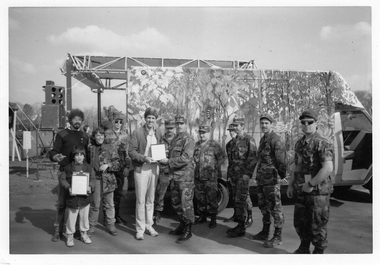 Ed was Chair of the BUG Board of Directors. 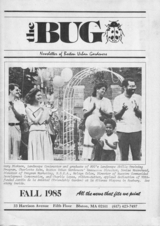 BUG was a pre-Internet virtual organization. 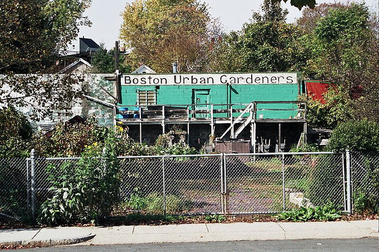 Boston's urban gardening explosion coincided with the resurgence of state's agriculture sector spurred by the implementation of an innovative policy that was adopted by Massachusetts Department of Food and Agriculture in 1976. 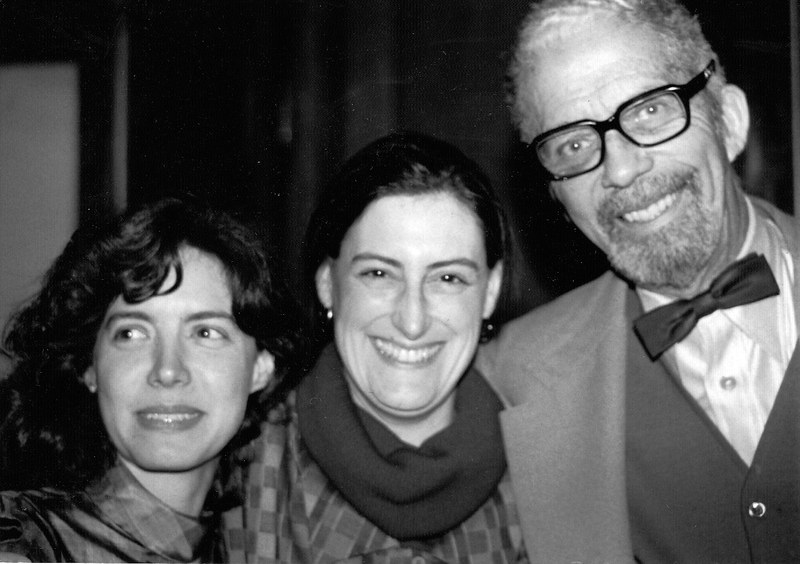 BUG was founded by the amazingly smart, savvy, talented and committed Charlotte Kahn. 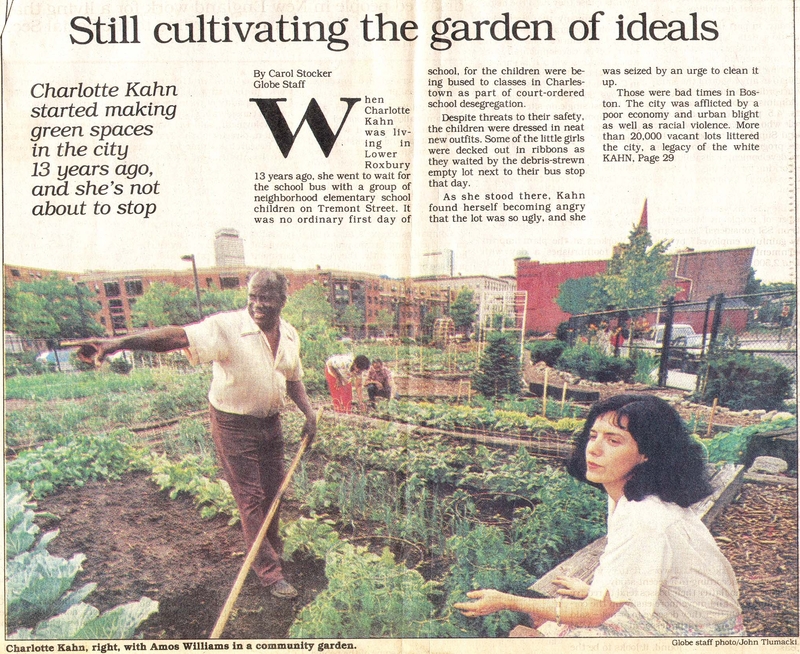 She, along with Wagner and Ed Cooper, long-time president of the BUG board, understood that because urban gardening is so empowering, it is inherently political. 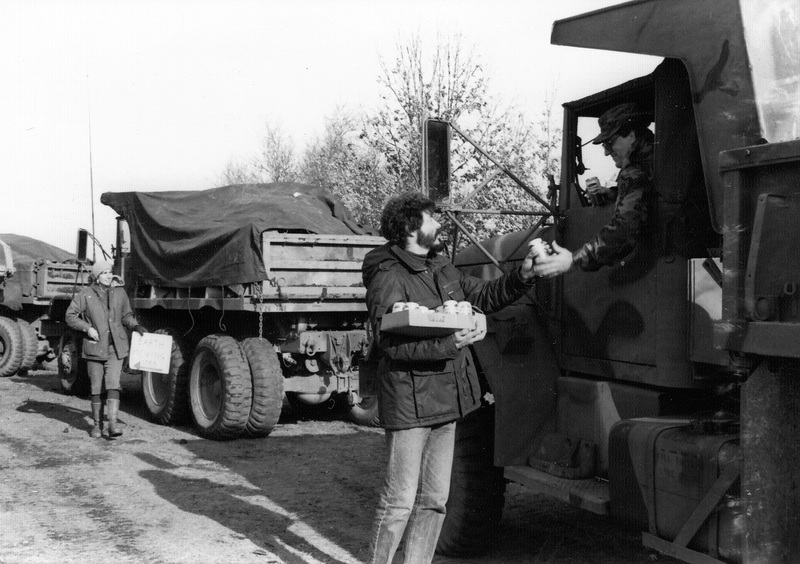 Elected officials thrive on keeping their constituents dependent upon them to some degree for their basic needs. 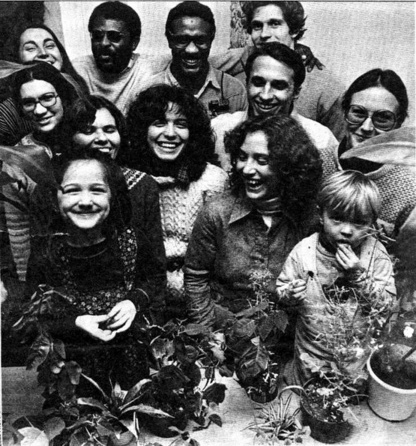 The more individuals and communities gain some measure over meeting these needs themselves, the greater the degree of parity between them and their political representatives. In 1985 BUG organized the effort to get the U.S. Army 642nd Batallion to move 5,000 cubic yards of topsoil from the University of Massachusetts Medical Center in Worcester, MA to community gardens in Boston neighborhoods. 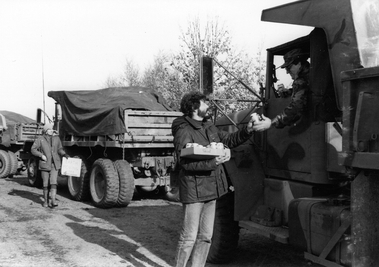 BUG provided the soldiers with lunch and agreed to pay their turnpike tolls. 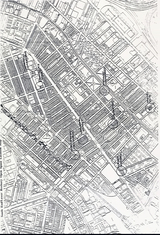 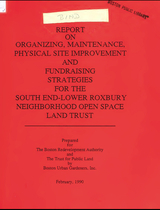 BUG worked with Boston mayor Ray Flynn and his staff at the Boston Redevelopment Authority (BRA) to identify city-owned parcels that for one reason or another were not suitable for housing or commercial development. 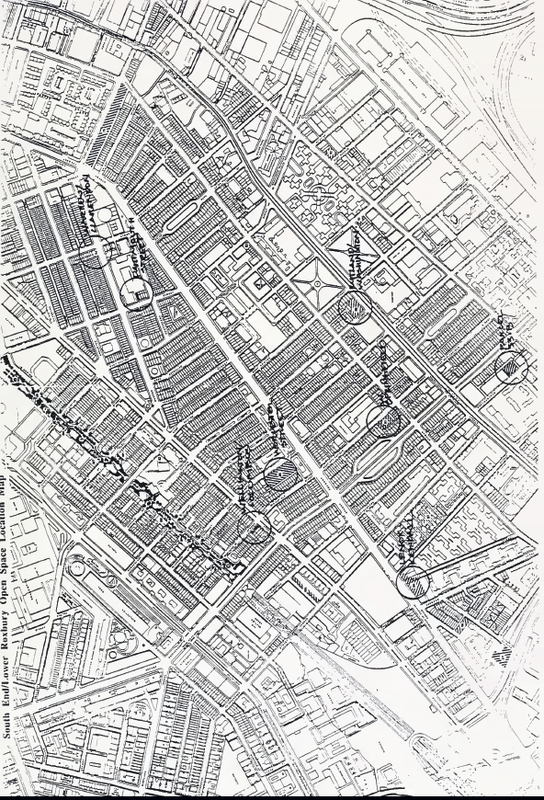 The city packaged them and made them available to BUG to purchase. 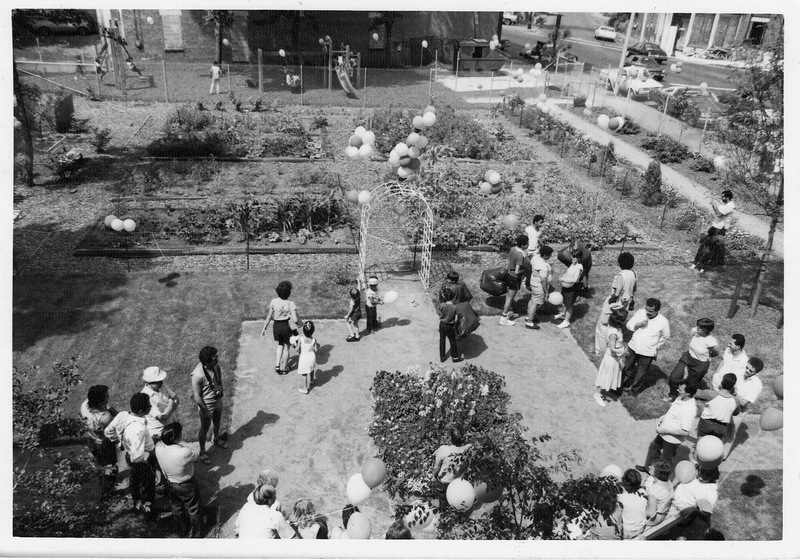 BUG raised money through raffles and other activities, purchased the land and turned it into a trust, preserving the land for urban gardening. Gaining access to gardening resources started with the very basics including topsoil and water. 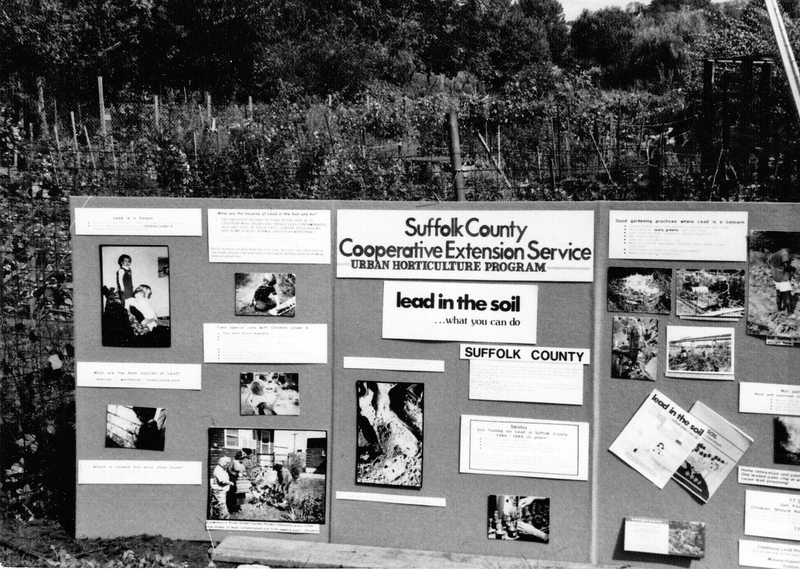 BUG worked closely with the Suffolk County Extension Service -- one of the first urban agricultural extension services in the nation - to test soils for lead and other toxic substances. 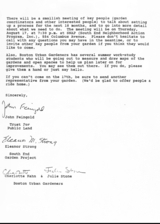 BUG organizers were without peer. 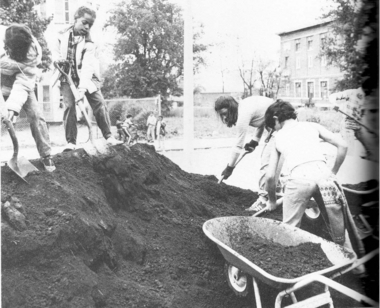 They were able to convince the National Guard to assist them in transporting clean topsoil from building sites to city gardening sites. 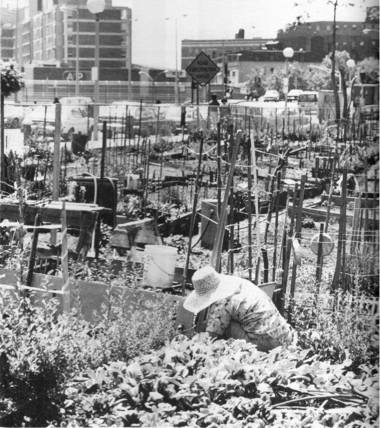 It may be hard to understand how difficult it was to gain access to land and other resources to establish urban gardens 25-30 years ago. 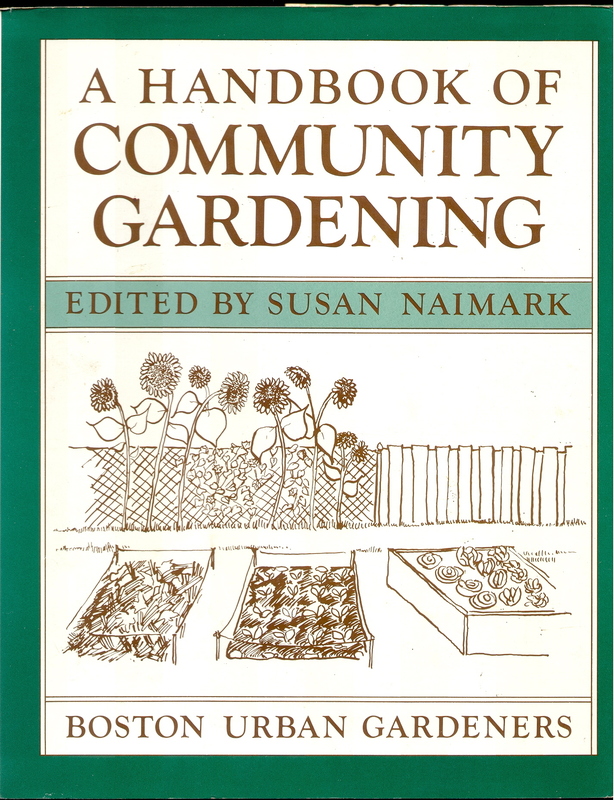 Bug published its Handbook of Community Gardening in 1982. 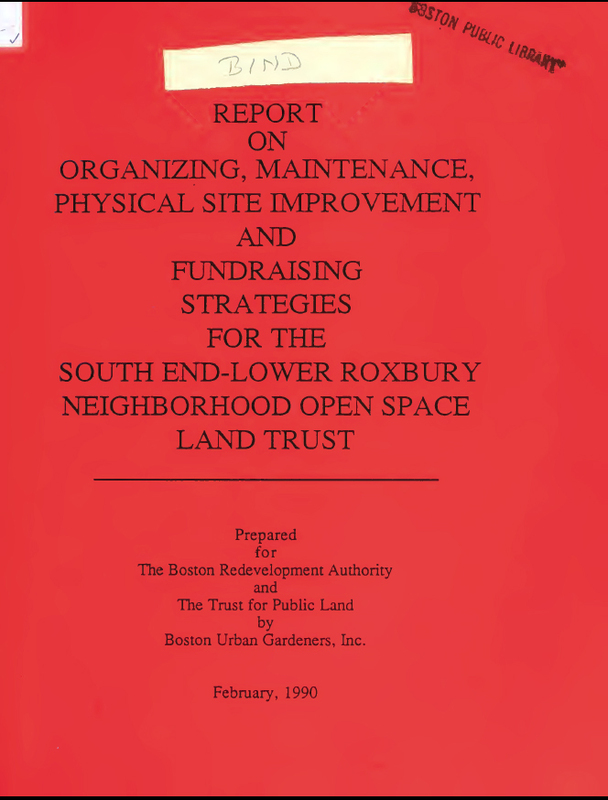 Although out-of-print, it remains relevant today. 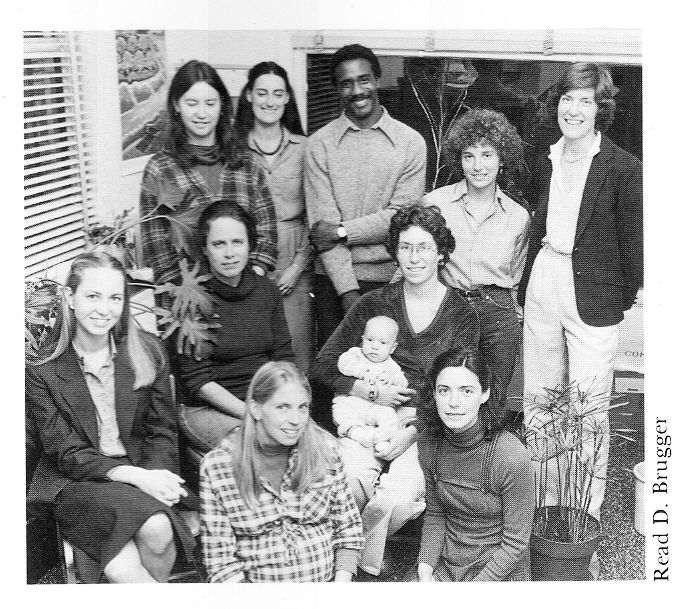 Contributing authors to the Handbook. BUG President Ed Cooper surveying his garden at his Roxbury home. 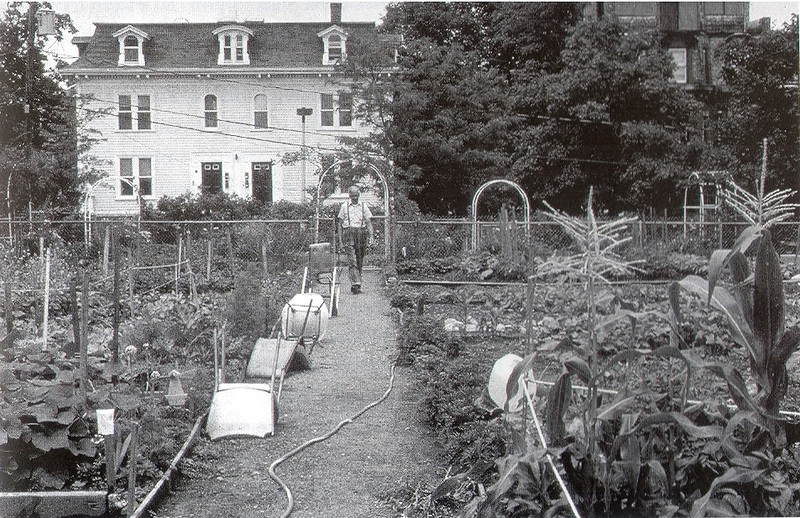 Planting in the shadow of the Orange Line: Southwest Corridor Community Farm.